The presence of the Amish and their strangely anti-modern lifestyle has turned this little section of Ohio into a prime tourist destination. Approximately 4 million tourists visit Holmes County alone each year, generating $154 million in economic activity. * I know firsthand about the appeal of this bucolic little slice of the Buckeye State: I make at least one trip to Holmes County when I visit Ohio from Ontario each summer. 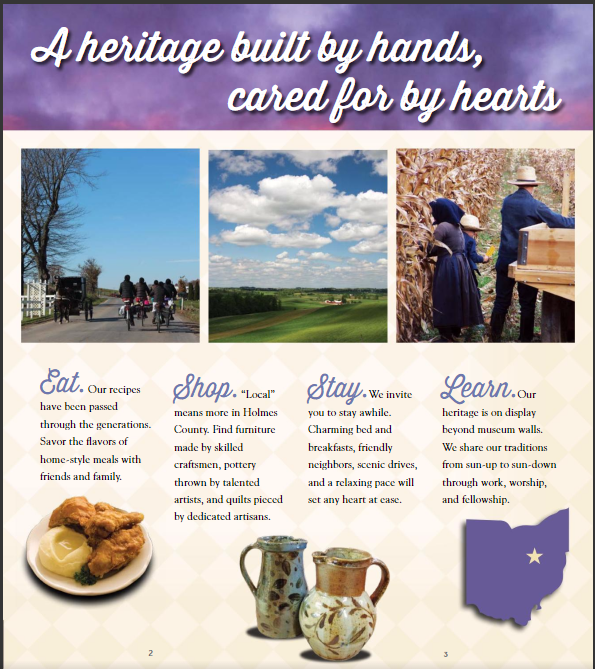 The welcome page for the 2016 Ohio Amish Country Visitor’s Guide promotes a down-home, rustic experience. The contrast here is as plain as the Amish themselves, for they are simple, rural, and unencumbered by the greed and soulless materialism that defines modern American life. Though it’s never stated outright in Amish Country marketing materials, the implicit assumption is that, in many ways, the Amish have it better because they choose to reject modernity. So, if the Amish have it better, why in the heck aren’t more Americans chomping at the bit to convert to a lifestyle of butter churning, buggy latching, and barn raising? Perhaps this is because we’d rather take the occasional break from the trappings of modernity, as opposed to giving them up entirely. In the eyes of most Americans (whose knowledge of the Amish may or may not be limited to a certain classic “Weird Al” Yankovic song), the Amish are the ultimate example of people who have rejected modernity. The rural landscape of Holmes County evokes a distinctly pre-modern feeling. The Amish are a breakaway Protestant sect whose origins date back to 16th-century Europe, round about the time Martin Luther was making himself into an chafing theological bur under the Pope’s robe. While Luther’s emphasis on Sola scriptura (that the Scriptures are the sole source of religious authority) was pretty darn radical in Catholic-dominated Christendom, an even more radical group, fittingly deemed the Radical Reformers, thought that the Reformation wasn’t going far enough. The Radicals’ primary gripes came down to a staunch opposition to infant baptism (which denied people the right to accept Christ on their own, conscious terms), as well as a fierce belief that church and state (which had been thoroughly entwined since the year 380, when Theodosius made Christianity the official state religion of the Roman empire) ought to be separate. The Radical Reformers also opposed state-sanctioned violence. By stopping the practice of infant baptism, they attempted to put an end to the state’s primary means of absorbing subjects for use as future warriors for Christ. 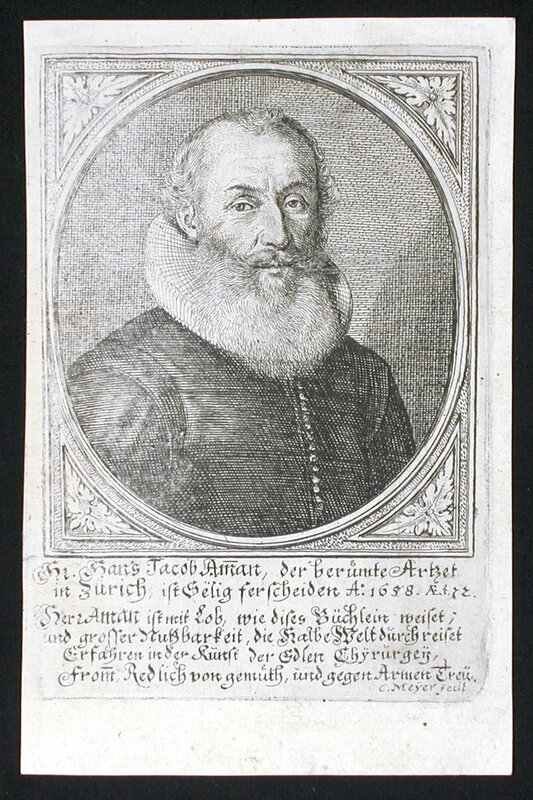 On January 25, 1525, a group of Radical Reformers gathered in Zürich, Switzerland to perform adult baptisms, a rite that eventually earned them the label of “Anabaptists.” For the next several centuries, the Anabaptists, led by charismatic figures like Menno Simons (whose followers are still called “Mennonites“) bounded around Europe, fleeing persecution. In quieter periods, however, the Anabaptists managed to thrive and even assimilate into local cultures. This didn’t sit well with one Jacob Amman. In the 1690s, Amman garnered a dedicated following by advocating a more stringent separation from “worldly” culture in order to preserve a pure Christian life. In 1693, Amman’s followers formed their own Anabaptist sect, the Amish. Persecution continued to follow the Amish, however, and by the early 1800s, many found themselves in America, where the fertile soils of Pennsylvania and Ohio suited their plain and simple farming lifestyles. “Plain and simple” still defines the Amish and their complicated relationship with modernity, and this includes a stern rejection of competitiveness, violence, individualism, and materialism — basically all the stuff that defines American identity. Johann Jacob Amman, founder of the Amish sect. The Amish are strictly non-violent, inspired by the Christian call to love everyone, even enemies. They live out their commitment to non-violence via Gelassenheit, a German word for “yieldedness.” Observing yieldedness means not willfully harming another person; it’s the truest expression of Christ’s suggestion that Christians should “turn the other cheek.” The Amish are also deeply devoted to communalism, which they display via their famous community-wide barn raisings and their reluctance to accept aid from the state. Witnessing for Christ in a violent, individualistic culture demands a communal effort. Finally, in order to separate themselves from “worldly” society and bear witness to God’s presence on earth, the Amish follow a strict set of communal rules known as the Ordnung. The Ordnung governs the most “Amish” aspects of Amish life. 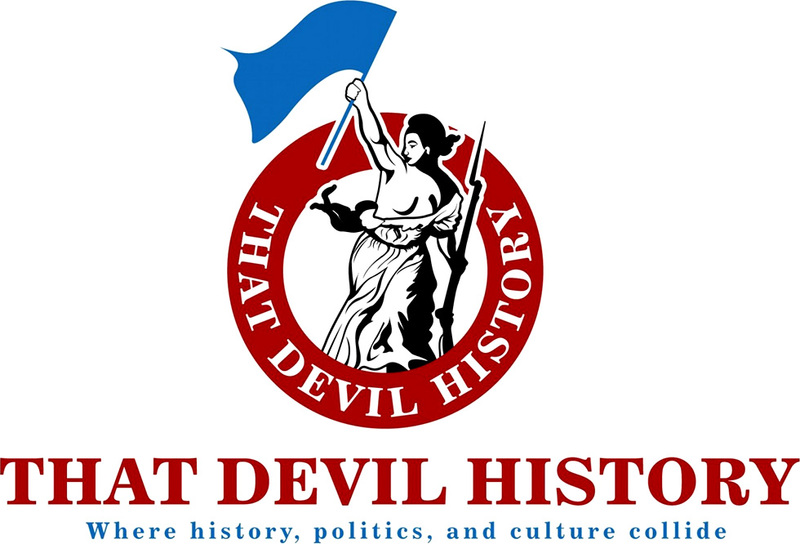 These include the solid black, blue, grey, green, and white clothing (hats, buttons, and beards for men — bonnets, dresses, and aprons for women), a school education that ceases roughly at age fourteen, a patriarchal family structure, and a resistance to new technologies that may inhibit traditional communal life. 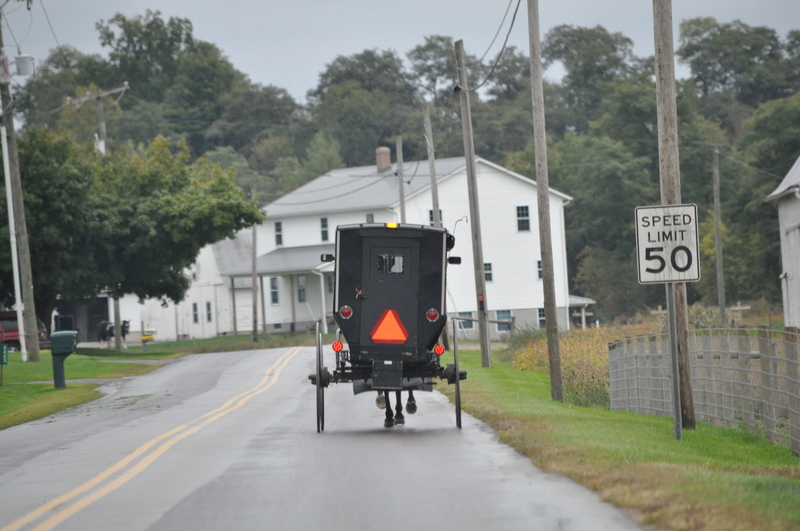 Thus, the Amish prefer horse and buggy to cars and generally shun the gadgetry — smart phones, television etc. — that turns other Americans into family ignoring screen-zombies. Oh, and the Amish also speak as their mother tongue a language known as Pennsylvania Dutch. Yet if the Amish define themselves in ways that contrast explicitly with the rest of America, why on earth are so many “English” (the term the Amish use for non-Amish) Americans drawn towards Ohio’s Amish country each year? The answer lies in a single word: nostalgia. The tourist construct that is “Amish Country” is a purposefully marketed peon to an imagined American yesteryear; a misty past when life was more simple and more rural, when families were deeply traditional, when hard work was a virtue, and when faith in God was a given. Essentially, the English marketers and business people who began promoting Ohio’s “Amish Country” tourism in the late 1950s understood that Americans have always had a love-hate relationship with the dynamic pace of modernity that defined their national culture. Every advancement that seems to make life easier — cars, smart phones, computers, automation of all kinds — also seems to add new levels of stress to the American lifestyle, including longer working hours, incessant emails, crashed hard drives, car payments, lost jobs, lost family time, antidepressants, and psychotherapy. 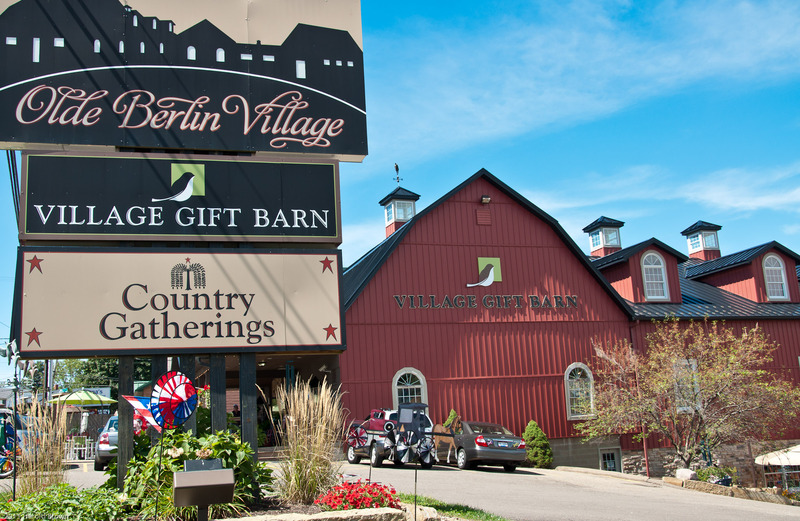 The main drag through Berlin, Ohio, where Amish communalism and American capitalism meet. Amish Country tourism, then, purports to offer Americans a break from the complexity of modernity via a trip to a place where the simpler past exists in the present. As Trollinger writes, “the Amish demonstrate that it is possible to slow down your life, to regain clarity about gender differences, and to reassert control over technology.”* It’s no coincidence that the latter aspects of Amish life are rooted in the past, as opposed to the present or the future. Americans’ nostalgic craving for this simpler past is what draws them to Holmes County, Ohio, where they can bask in the cultural glow of the Amish and thereby get a temporary mental reprieve from the tyranny of emails without having to actually give up their internet. A trip to the towns and villages that make up Ohio’s Amish Country will take you to the past without ever having to leave the present far behind. First of all, the landscape itself — beautiful, rolling hills and freshly tilled farm lanes — is a major draw, especially since the rural lifestyle is now an abnormality in majority-urban America. Beyond the bucolic splendor of the scenery, there’s the shopping. Amish Country tourism is all about selling the simple, home-style country lifestyle, Amish or otherwise. The main streets are populated by the kinds of Mom and Pop boutiques — bulk food stores, antique barns, bakeries, cheese houses, flea markets, farmers’ markets, butcher shops, and all manner of shops hawking “rustic Americana” themed trinkets and tchotchkes — that Wal-Mart usually devours for brunch. In Berlin, for example, you can visit Sol’s craft mall to buy everything from inspirational signs to patriotic napkin holders. In Millersburg, you can go to Heini’s Cheese Chalet to stock up on raw-milk cheese and fudge made with ingredients from Amish farms. Then there’s the food. Ohio’s Amish Country is home to mammoth, buffet-style country restaurants like Der Dutchman and Dutch Valley that serve up heapin’ helpings of artery-clogging, “made-from-scratch meals” like mashed potatoes, broasted chicken, fry pies, and pudding and donuts — the kind of slow-cooked grub that Americans no longer have time to make for themselves. 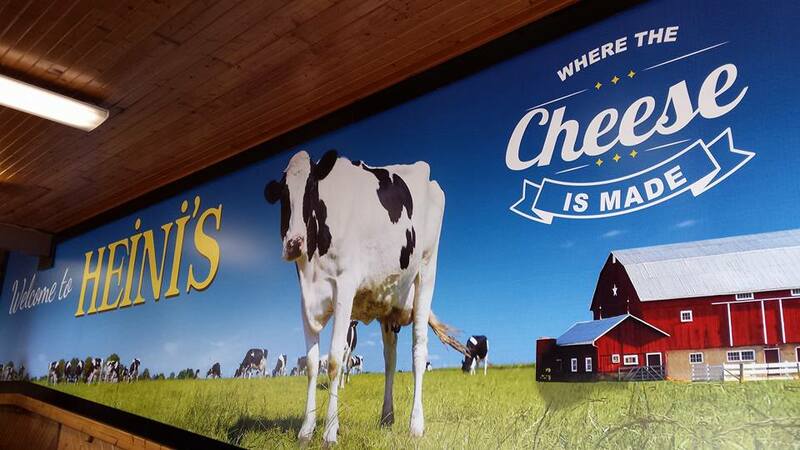 The mural depicting the rural lifestyle inside Heini’s Cheese Chalet in Millersburg, Ohio. Thus, Amish Country is a curious phenomenon: it’s a capitalist, consumerist enterprise that uses a communalist, anti-materialist people to sell a nostalgic notion of an agrarian past to tourists who’d prefer to merely take a brief vacation from, rather than abandon, modernity. In fact, “Amish Country” would appear to be a gigantic sham if you believe that the Amish themselves are truly a people separate from all that makes up modern America. The Amish, however, are more complicated than that. They are both distinctly separate from, and highly representative of, America itself. Despite the commonalities in beliefs and customs that unite the people that we outsiders call the “Amish,” there really isn’t a single, monolithic group of “Amish.” There are actually multiple affiliations of Amish people. The ultra-conservative Swartzentruber Amish are the most “anti-modern” of all the Amish: they reject cars, electricity, and indoor plumbing and are the most restrictive in terms of the overall use of technology. The Swartzentrubers are what most Americans think of when they conjure up a generic image of “the Amish,” but this group makes up a very small share within the subgroup of Old Order Amish. Speaking of the latter, there are both Old Order and New Order Amish settlements. The New Order are generally more progressive in dress, doctrine, and willingness to embrace some aspects of technology (telephones, electricity, and tractors, for example) than the Old Order. The most progressive of the New Order groups, the Beachy Amish, actually own and drive automobiles, send emails, and generally exist as both Amish and “modern” Americans. They avoid “conspicuous consumption,” but will own televisions; they are strict pacifists but operate their own businesses. As Charles Hurst and David McConnell write in their excellent book An Amish Paradox, “The Holmes County Settlement is rife with diversity, internal disagreements, and varying adaptations to the conflicting forces that members must face.”* This diversity among the Holmes County Amish is the product of “ongoing negotiations between the individual and the community, between freedom and regulation, and between tradition and modernity.”* In Holmes County, you’ll find self-made Amish millionaires, public school advocates, and female entrepreneurs living alongside electricity-shunning traditionalists and old-style family farmers. 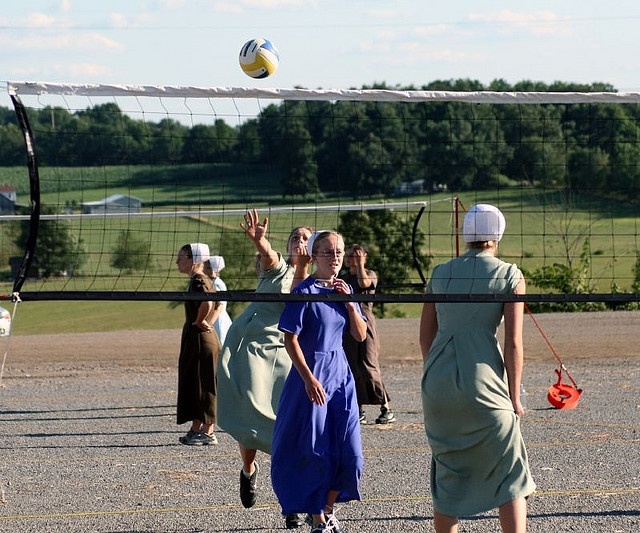 Sneaker-wearing Amish women play volleyball in Mt. Hope, Ohio. For all their separateness from American society, the Amish nonetheless reflect the American experience as much as any office-toiling, suburb-dwelling, Whopper-gorging “English” person. Despite their devotion to communalism, they’re also consummate capitalists who thrive in trades like furniture making, lumber production, factory work, contracting, and retail. 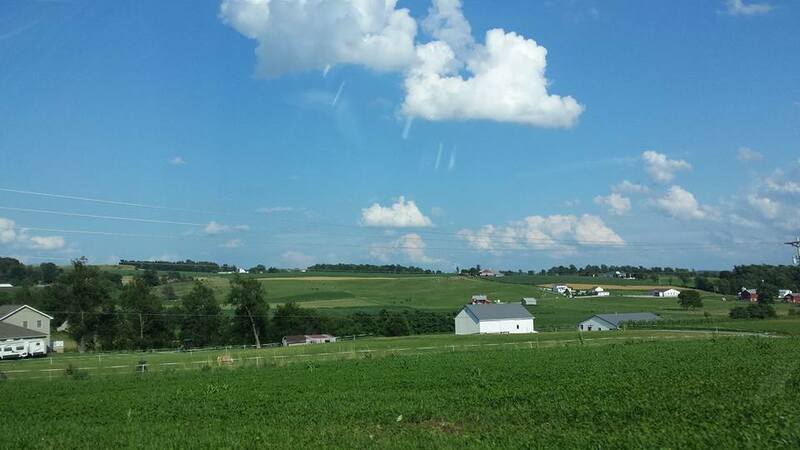 In fact, thanks to soaring land prices, the trend among Amish in Holmes County now bends towards non-farming work. * Most Holmes County Amish also work in some capacity with the English residents of the county, making their preference for separation far more cultural than physical. Even when it comes to that most worldly of American traditions — voting — the Amish sometimes participate. Holmes County is a deeply conservative Republican county, and thousands of its Amish residents were among those who voted for Donald J. Trump, the living embodiment of all the worldly materialism, crass consumerism, boorish egoism, and boastful lasciviousness that the Amish supposedly reject. It would be a huge and insulting stretch to claim that the Amish aren’t that different from the rest of America, because they are very different. But the Amish are human first, Amish second, and as humans living in America, they can’t help but absorb much of the Americanness from which English Americans paradoxically try to escape by visiting Amish Country. They’re dedicated to communalism, but they’re also crafty capitalists who embody the Protestant work ethic better than anyone. They live separate from American society, yet they’re highly dependent on the economic benefits that English tourism to Amish Country provides. The existence of that tourism speaks to that most fundamental of American paradoxes: we relentlessly embrace modernity even as we try to buff its rougher edges with manufactured nostalgia. That “English” Americans look towards a separatist people in their midst as the source of the down-home goodness that the English can no longer create for themselves is emblematic of the ever-shifting cultural insecurity of the American experiment. Being American means craving the simple life in the most complicated way possible. Americans created an empire, but they would really rather churn butter — as long as it means not having to give up their empire. The Amish buggy: a symbol of a lost past. * See Susan L. Trollinger, Selling the Amish: The Tourism of Nostalgia (Baltimore: The Johns Hopkins University Press, 2012), 26, 36, 42, 144. * See L. Diane Barnes, Brian Schoen, Frank Towers, eds., The Old South’s Modern Worlds: Slavery, Religion, and Nation in the Age of Progress (New York: Oxford University Press, 2011), 10-11. * See Charles E. Hurst and David L. McConnell, An Amish Paradox: Diversity and Change in the World’s Largest Amish Community (Baltimore: The Johns Hopkins University Press, 2010), 1, xi, x. 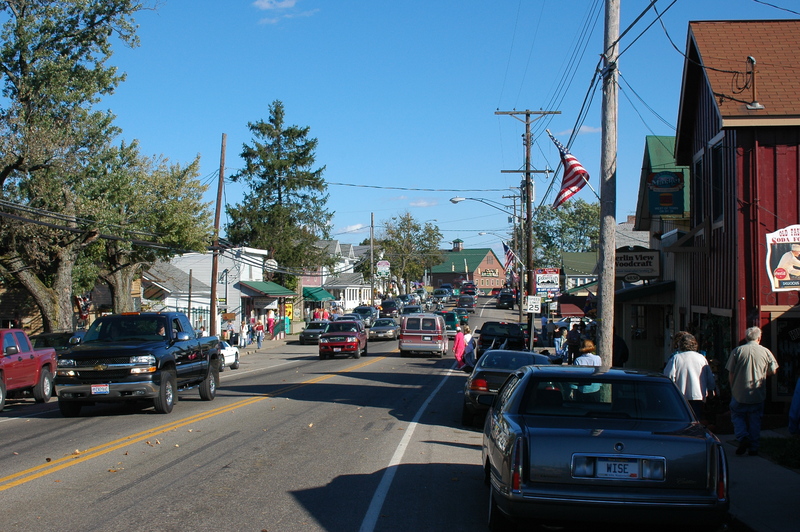 Previous Article← Save the American Small Town? Interesting piece, Jarret. I must confess my ignorance that I did not know that there were Amish living in Ohio–I thought it was only Pennsylvania. And it’s too bad the Amish you speak of voted for Trump and can only hope that a few are having buyer’s remorse. If I had to guess, they probably felt, like many evangelical Protestants, that the candidate for the Republican Party better represented their values and their prioritization of religion even though, as numerous commentators have pointed out, Trump is far from a paragon of morality and virtue. As I was reading your post, I recalled a book I read in graduate school called AGAINST THE MACHINE by Nicols Fox. I remember having some analytical and evidentiary issues with the book but it starts out with this example of a person who lives on an island off the coast of Maine, cut off from electricity and other amenities. It’s obvious that I couldn’t go that far, but when you think of all the negatives that come from social media–negative comparisons to others, FOMO, body image issues, distraction, anxiety, inability to concentrate–you come away with an admiration for people like that who are willing to take strong stances and live by their principles. I remember feeling in 2007-2008, when I first arrived in Santa Barbara, that I did not like that everyone was using smartphones. A whole bunch of overpriced and unnecessary technology being shoved down our throat, I thought, and giving people a BS “identity.” Now I think, yeah, that was soooooooo 20008!! Anyway, I am glad that you’re still posting.